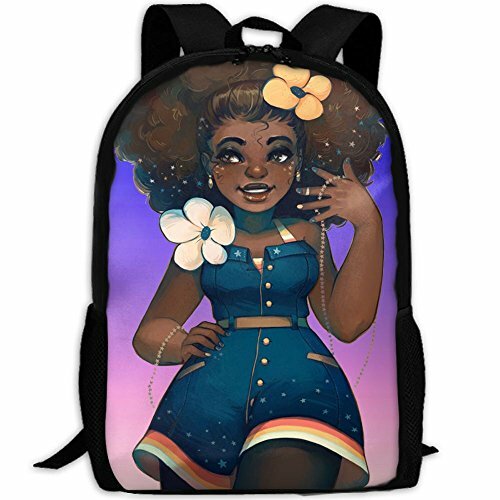 1.This Backpack Is A Cute,fashion,durable,lightweight,comfortable And Multi-functional Back Pack, Made Of Water Resistant And High Quality Anti-scratch Nylon Oxford Fabric With Exquisite Workmanship Which Makes It More Strong And Sturdy,and Very Easy To Wipe Clean. 2.One Roomy Main Double Zippered Pocket With An Inner Pouch Can Safely Store And Organize Your Books, Notebooks,clothes,folders,camera,umbrella,or So On,two Side Pockets For Water And Bottles. 3. A Great Schoolbag/children Daypack/travel Bag/picnic Bag Where Fun Meets Function, Perfect On-the-go Pack Teen Girls And Boys, Ideal For School,travel,trip,outdoors Activities (camping, Picnic). Great Choice For Black Friday, Thanksgiving & Christmas Gift Idea. Due To The Brightness Difference Among Monitors,there Will Be A Slight Color Difference. Recommended Age:above 15 Years Old,Perfect Size For Teenager College Student.Size: Height:17",Depth:6.3", Width:11" Inch,easy To Use,Stylish,fashionable Design Brings More Happiness To Carry It All The Time.Personalized And Unique Design,Not A Usual School Backpack You Can Find Anywhere Else, 3D Printing,unique,funny,modern,fashion. Material: 600D Anti-scratch And Easy To Wipe Clean Nylon Oxford Fabric,Water Resistant,Lightweight And Durable Youth School Backpacks For Girls Boys School Bags Bookbags For Teens. Appearance Features: Adjustable Padded Shoulder Strap Straps For Ultra Comfort And Stability,can Be Adjusted According To The Needs.Compartments: 2*side Mesh Pouch For For Water Bottle Or Umbrella Etc, 1* Zipper Main Pocket. Wide Use:Perfect Crossbody Bag For Day Trips,Vacation,Travel,Hiking,School,Sports,Yoga,Outdoor,unique And Personalize Design,creative Gift For Yourself And Your Friends.Unisex.Multi-purpose Bag. RISK FREE GUARANTEE - Your Purchase Is Fully Protected When You Order Today. If You Are Not Satisfied With Your School Bag ,contact Us Any Time, We Will Get You Back Within 24 Hours Try Our Best To Make Things Right!Shipping:7-15 Days.